For starters, AMR is a compressed audio format developed by Ericsson. It is used by many 3G cell phones for voice recordings such as MMS messages and incorporates the Algebraic Code Excited Linear Prediction (ACELP) algorithm. You can playback AMR audio recording on your computer by converting AMR audio file into MP3 format using free converter program. 1. Download AMR to MP3 converter program and install it on your computer. 3. Load AMR file in program and select one ‘.mp3’ audio file. 4. 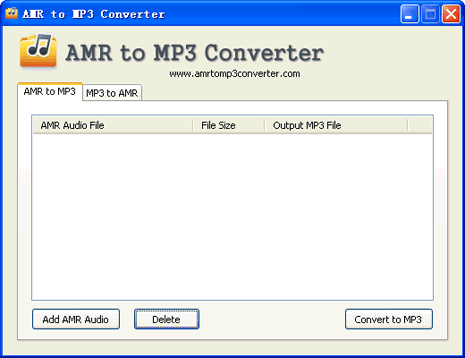 Click ‘Convert to AMR’ button for conversion of AMR into MP3 format. You can also perform reverse conversion of MP3 audio file into AMR audio by clicking “MP3 to AMR” tab on the program window. It’s taken me all day how to figure out how to get some answer machine messages off my home phone then record to my mobile then transfer to my pc – but then i didnt know how to convert. So you have done me a huge favour with this. The program permanently takes up a lot of space on the task bar with the line “amr to mp3 conversion” or so. It is non-configurable. That is too much for a utility one hardly uses – instead of installing itself, it should be portable, so it’s only there when you want it to.